Our 3-month séjour in San Francisco has come to an end, and we are now back in France. Our first stop is Paris, where we decided to spend a couple of days at the Hotel Observatoire Luxembourg in the 5th (107, boulevard Saint-Michel, tél: 01.46.34.10.12). Our goal on this stopover in Paris was to shop for a set of nice pots and pans. We have never seen box sets of pots and pans down on the Côte d’Azur, and we were hoping to have better luck in Paris … however, it didn’t happen. So, we ended up buying our cookware, one piece at a time, at the only Grand Magasin on the Left Bank of Paris, and the oldest department store in France, Le Bon Marché in the 7th at 22-24 rue de Sèvres – Metro: Sèvres-Babylone. And, the good news is that they will deliver it to us in Antibes, so there will be no need to lug it around with us on the train ride home. Normally, our favorite shopping at Le Bon Marché involves ogling the beautiful displays of food in its Grande Épicerie, a grocery store which may be the largest food market in Paris with 2,700 square meters of artfully-arranged delectable edibles – a food lover’s dream. Le Bon Marché was the first, or at least one of the first, true department stores when it was built in the middle of the 19th century. It was Aristide Boucicaut, the founder of the company, and his wife, Marguerite, who introduced the concept of shopping as a fun and interesting pastime where women could spend their days wandering around a beautiful environment, basking in a sea of luxury goods. Their philosophy was to provide a product of excellent quality at a very good price. In this light, they introduced the concept of allowing the customer to either exchange their purchases, or to be reimbursed for them when they were not completely satisfied. They also provided catalogues from which customers could order products, and they provided free shipping. It was the Boucicauts who invented the summer sale, which still takes place, by law, all over France throughout the month of July. Always concerned about the well-being of their employees, they were pioneers in instituting Retirement Pension Funds, providing in-house medical services, and offering free classes to their employees to learn English, music, etc. The concept of the “Department Store” was so unique and revolutionary that Emile Zola wrote a fictionalized book called “Au Bonheur des Dames” (1883), in which a Department Store, modeled after Le Bon Marché, was the main character. The other lead characters, Octave Mouret and Denise Baudu, were based on Le Bon Marché’s founders, Aristide and Marguerite Boucicaut. An English translation of Zola’s book was also written and is entitled, “The Ladies’ Paradise”. Hi Linda - I agree that the Galerie Vivienne is truly lovely. 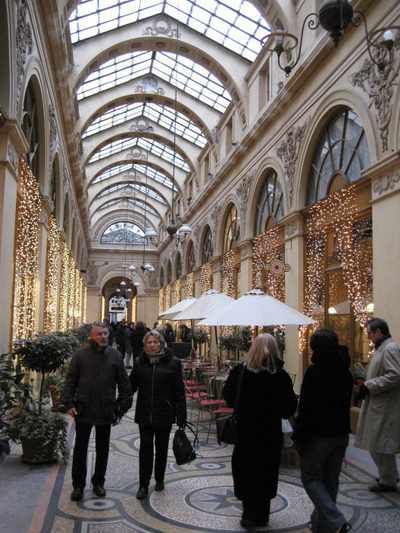 I am also interested in the history of this and the other arcades in Paris. It might have been more appropriate to have posted a photo of the Bon Marche, but, unfortunately, I didn't have one. Your photo is of one of my favorite passages in Paris. I think it is truly lovely.